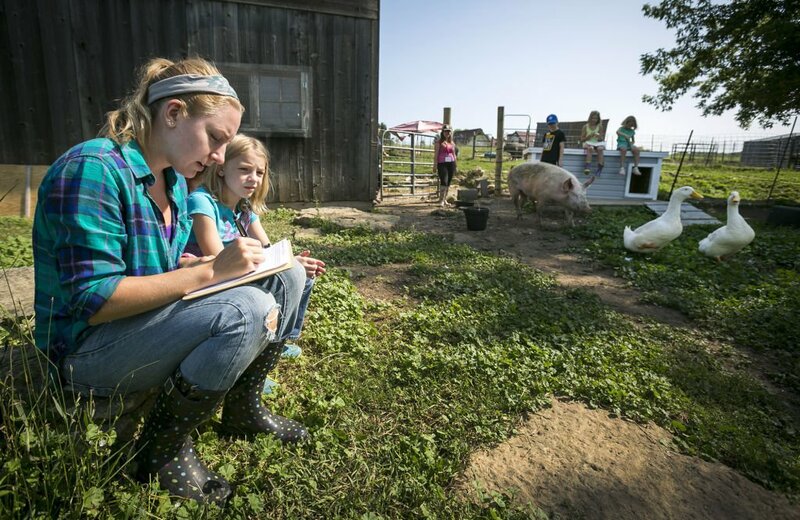 Camp counselor Breanna Swan, left, works with Brynja Helmers, 9, on writing down observations at the Heartland Farm Sanctuary in Verona. 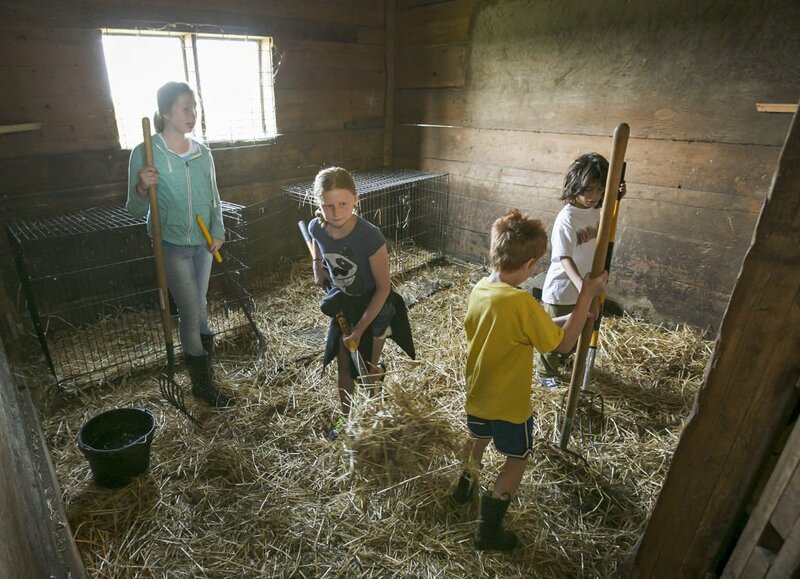 Jasmine Luck, center, 10, along with Hailey Schoff, left, Kieran Fain, 8, and Tiger Harkins, right, 9, clean a stall at the Heartland Farm Sanctuary in Verona. Rescued animals at Heartland Farm Sanctuary get lots of love every summer from the youths who come to camp at the 90-acre property in Verona. At one of the eight week-long sessions this summer, many of the campers said they had come to Camp Heartland before. Despite a mix of farm animals that includes chickens, ducks, donkeys, goats and pigs, the favorite animals for some are the cats that roam the property. The campers start the day either observing ﻿animals or doing chores such as preparing the animals’ food, filling swimming pools and setting up feeders. Sunshine Stokes, camp director, said mucking, or hauling away the animal waste, is a favorite activity. “I guess I just know I’m helping the animals and giving them a clean place to sleep,” Ella Mueller, 11, who will be a sixth-grader at St. James School, said about why she likes mucking. The rest of the day is a mix of activities as the campers learn what animals need to be happy and healthy and get an in-depth look at pigs and chickens. Guest speakers come to﻿ share their animal expertise. One afternoon the campers and some of the farm animals traveled to the Dane County Humane Society, where they participated in Camp Pawprint held there. “It is a way for us to educate them on farm animals and it is a way for them to educate us on pets,” said Stokes. The campers also learn about ﻿native plants and fossils on the property and write short stories or an account of their week at camp for the sanctuary’s website. They go on a scavenger hunt, do arts and crafts, and interact in various ways with the animals such as reading to the blind pig or brushing goats or sheep. “A big focus is on humane education and giving kids a lot of time to bond with the animals,” Stokes said. The camp, which is open to children ages 7 to 12, costs $200. Heartland Farm Sanctuary also will be running a half-day version of its summer camp for eight Saturdays this fall, beginning Sept. 6. It also is offering “Youth Barn Time” on Tuesdays or Saturdays for eight weeks beginning the week of Sept. 14. Designed for youth with special needs, the barn time program pairs a child with a student from the UW-Madison School of Rehabilitation Psychology and Special Education Department for activities and learning at Heartland’s barn.